The EVEREST+ is built for pure hunger for experience outside of any and all conventions. The wing offers you the freedom to keep all your options open through its minimal pack weight. May it be in the reliable thermal spots, travelling or at alpine adventures. 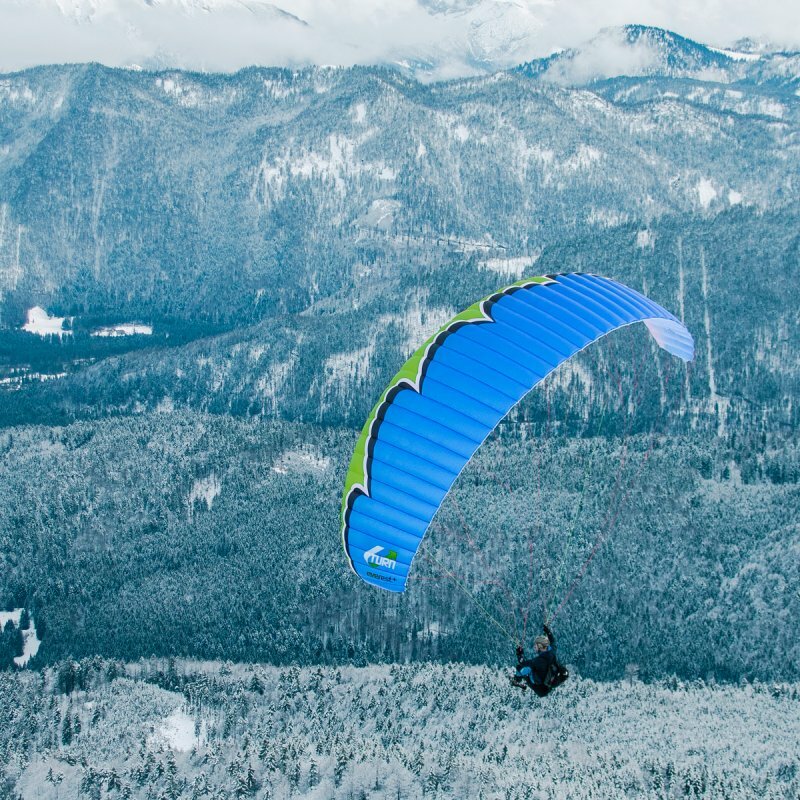 Based on the successful Hike&Fly wing Everest the plus provides even more flight fun, more handling and even smaller pack size. A new line concept with three covered main lines per riser and a new light weight clothing are what make the upgrade perfect. 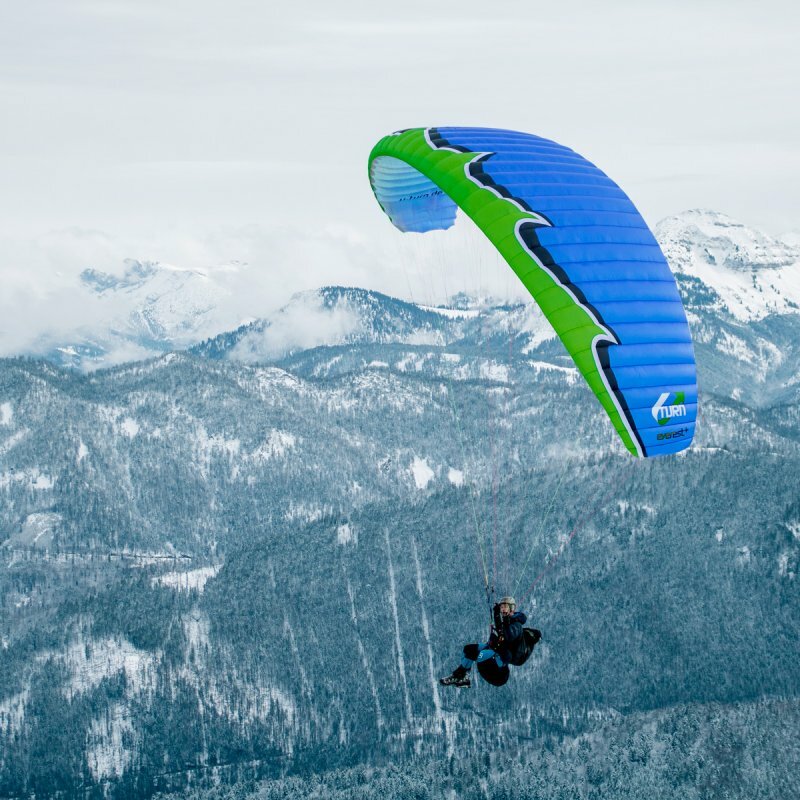 The Everest belongs to the lightest full value gliders in the world. The wing has a huge fan community, because the lightweight miracle additionally convinces with outstanding glide- and rise features. The wing is designed for the hard alpine usage, although it was consciously meant for the everyday use. In favor of the ideal durability, a few more grams additional weight were accepted. Following the motto “make the best even better”, the newest version EVEREST+ surpasses itself and therefore plays in a separate class. Of course the basic features should not only be kept through the upgrade but even be improved – and that was definitely achieved with the plus. The canopy deforms considerably less than its predecessor and remains calm even when in turbulent conditions. 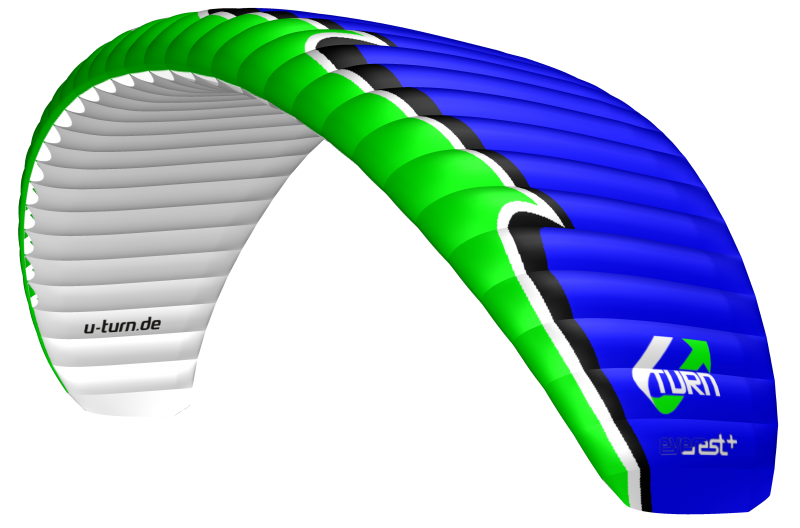 Should a pressure balance be needed after all, the extremely light canopy opens quick as lightning and still soft. Additionally the wing almost doesn’t turn away, even during heavy collapses, which guarantees a big safety-plus especially when flying close to rocks in alpine flights. The subtle and direct handling with short control ways and precise reactions of the wing remained. A fat plus is also appropriate when it comes to the starting features. 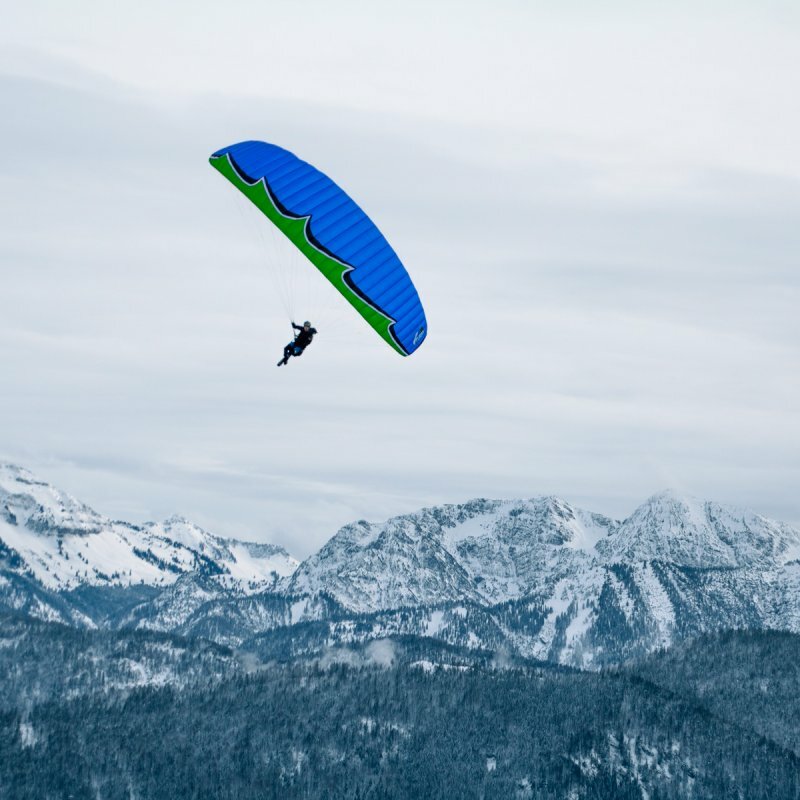 The light canopy rises problem-free, even in zero wind, to the zenith of the pilot and offers an exceptionally easy start behavior, even in demanding alpine conditions. The EVEREST+ offers maximum performance at a minimum weight. The wing is aimed at all experienced pilots who want to redefine freedom – with the possibility to operate unlimitedly. On the mountain, travelling and when flying in the reliable thermal spots. The EVEREST+ is available in the four sizes 16, 19, 21 and 23 and thereby covers a weight range of 50 – 120 kg. Schedule your test flight and experience the lightweight miracle yourself! What also remained of the base is the layout, number of cells, and AR. Chief designer Ernst Strobl counts on the new line geometry of the upgrade with three covered main lines. That is not only providing an easier handling during the start on the ground and when doing Big Ears, but also has an overall positive impact on the flying characteristics. At the same time 12 m of lines were saved, through which, combined with the lower diameter, the drag of the lines could be reduced by as much as 8 %. The line attachment points for the A- and B- lines are completely hung up on the profile, that saves material on the V rips and raises the weight distribution per line attachment on the profile. The modified pre-tensioning of the wing and the lighter Precision Profile Nose (PPN) are enabling an ideal flow around the profile. Elaborate new calculations of the cross aeration through the High Pressure Crossport Design (HPCD) are helping the wing to a balanced internal pressure. At the material mix of the EVEREST+ a special focus was placed upon the durability and profile fidelity and not just the weight reduction. Instead the proven long term endurance of the materials was in the center of attention. The used light material Dokdo 10D has a double-sided coating and is not only the lightest material on the market, but also superior to customary materials in the matter of porosity. The design is consciously limited to the heavily loaded front part of the upper sail, where the hard-wearing Dokdo 20 was used. Schedule your test flight and experience the lightweight miracle yourself!